(l to r) Anna Cardinal, 3, Lara Roche-Santos, 6, and Emma Burney, 4, keep the beat with shakers and maracas as Bob Bloom performs in "Drumming About You," presented July 13 at the Hudson Public Library Children's Room. 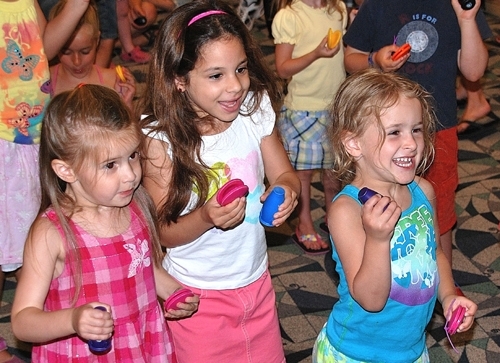 Photo/Ed Karvoski Jr.
Hudson – (Anna Cardinal, 3, Lara Roche-Santos, 6, and Emma Burney, 4, keep the beat with shakers and maracas as Bob Bloom performs in “Drumming About You,” presented July 13 at the Hudson Public Library Children&apos;s Room. 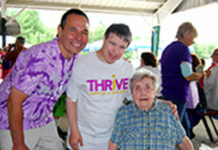 A roomful of children of all ages and their caregivers joined the interactive musical program that included drums and various percussion instruments. The sing-along featured numerous styles including funk, folk, and rock and roll.